I have spent some time over the past few weeks writing about various different ways of producing oil from oil shale. While it is now about time that I move on to other topics, David Hagen was kind enough to post the website that gives access to the presentations from the Oil Shale Symposia that I mentioned at the beginning of this mini-series. The papers from the 28th Symposium in 2008 illustrate that while the current price of oil may not currently justify the development of large oil shale operations, it can justify the investment of research dollars to seek better ways of producing oil from these fields. This is particularly true if one accepts one of the criteria that Exxon used to justify their ongoing interest, namely that they project that world energy demand will be 40% higher in 2030 than today, with more than 80% of that energy still being supplied by fossil fuels. Exxon believes that the oil from oil shale will play a significant role in that supply. And so I am going to skip lightly through the papers, and highlight anything that catches my eye. ExxonMobil sees tantalizing prospects for shale: up to 162,000 barrels of oil per surface acre at a 50 percent recovery rate. 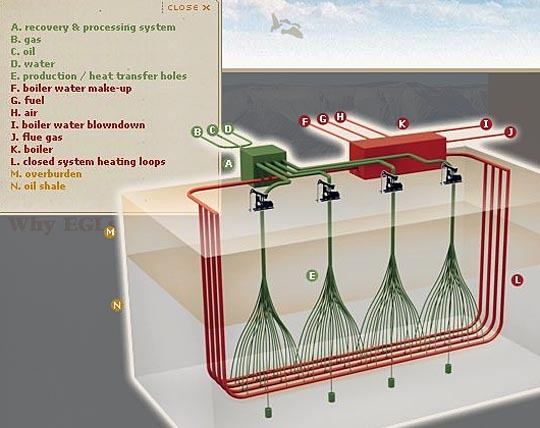 The results suggest a 3-to-1 ratio of energy recovered over energy expended to obtain it, McGinn said...It appears ExxonMobil can make its process work using about 1.5 barrels of water for each barrel of oil produced, he said. 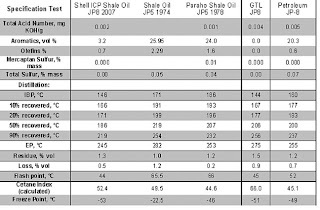 Even under the most optimistic of scenarios, ExxonMobil sees no production coming from oil shale for 10 to 24 years, McGinn said. The U.S. Bureau of Mines did look at fragmenting the oil shale beds in place and then igniting them for an in-situ variation on the Ecoshale process I described last time (in the sense that the shale is heated within a geological retort). There is work being done by Total (who slipped in a comment that oil supply may peak before 2015. They see the world potential supply from oil shale as being measured in trillions of barrels of oil. They are collaborating with Petrobras in surface retorting programs and along with other companies encouraged by the Jordanian government evaluating deposits in Jordan, which is also examining microwave heating and Morocco. 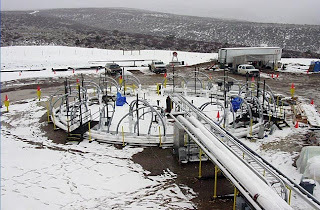 They are collaborating with Independent Energy Partner on geothermal fuel cells for in-situ heating and looking at downhole radio-frequency heating. There has been a subsequent paper on the Moroccan oil shale development. The use of radio frequency heating was described, with the Bechtel/Parsons conclusion that the process could yield an EROI of greater than 3. And the potential for using wind energy to power the microwaves was advanced. The program being developed by EGL where the heating is supplied around the outside of a series of wells was also included. 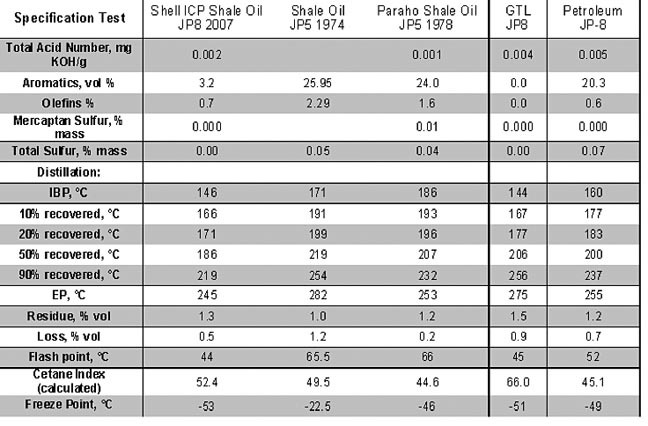 There is a report available on unconventional fuels that looks at oil shale, transmitted in December 2008. There was also, from August of that year, a complimentary list of companies carrying out research into oil shale and tar sands. The Power Engineering Institute in Moscow discussed some of the work being done in Russia on both their deposits and those in other parts of the world. The Narva thermal refinery in Estonia has, for example, increased production to over a million barrels exporting about 40% of the product. The plant uses ash as a pre-heating step, and used automobile tires as part of the feed stock. A better list of some of the oil shale projects can be found at the Oil Shale Association. One thing is clear from perusing both the Proceedings and the additional papers that I have chased up to try and update some of the information. 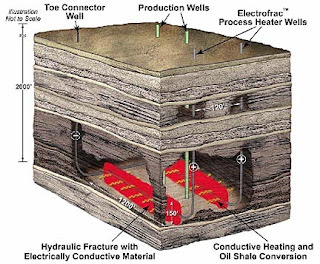 The Oil Shale resource around the world will become an increasingly viable one as the price and availability of conventional oil become more of a strain on the world and individual nations. This is being recognized by countries such as Jordan, China and, Thailand. Plans range from continued examinations of more exotic methods for oil recovery, to the more conventional mining and surface retorting. The level of activity appears to be rising again, and thus while the continuous posting on the topic will now halt, I will come back to the subject intermittently in the future. It is a comment on the perceived future scarcity of conventional oil, that this subject is receiving so much attention. The problem with Exxon's justification for pursuing oil shale that you mention at the begining of this article, that is that energy demand will rise by 40% by 2030 and 80% of demand will still be met by fossil fuels, is that that is a business as usual scenario in which we fry the planet. That is according to the IEA. What you, Exxon, and most oil companies (I can quote BP & Shell for starters) are referring to with those figures is what the IEA calls its "reference scenario". That is where energy demand is going if there are no further policies enacted or action taken to constrain global greenhouse gas emissions. In the IEA's own words: But these Reference Scenario trends have profound implications for environmental protection, energy security and economic development. The continuation of current trends would have dire consequences for climate change. (…) taking us towards a concentration of greenhouse gases in the atmosphere in excess of 1000 parts per million (ppm) of CO2-equivalent (CO2-eq). This, the outcome of the Reference Scenario, would almost certainly lead to massive climatic change and irreparable damage to the planet. This is from the IEA's World Energy Outlook 2009. According to the IEA, in order to avoid the dire consequences of climate change, fossil fuel consumption must peak by 2020. Primary energy demand will only grow 20% from 2007-2030 not 40%, and fossil fuels will be 68% of total energy demand not 80%. Unconventional oil such as tar sands and oil shale will not be supported by price or demand to anything like the degree in which they would in the reference scenario. Efficiency and alternatives will constrain the growth in demand. So while it's very interesting to hear how clever oil companies are getting at cooking this stuff out the ground, it would appear that they should really be putting more resources into alternatives and efficiency. We have to reduce oil demand to help control climate change. And doing so will improve energy security and envrionmental health. It is time the oil companies looked beyond business as usual scenarios to justify their addiction to the oil business and woke up to the fact that business as usual is not an option in the future. Or there may be no future. I have developed a successful oil shale process, 50 stpd pilot plant operating near Vernal Utah and it has been selected to develop 6 billion tons of oil shale in Nong'an China. It uses very littel water, low heat energy and has a 96% diesel yield from the kerogen. 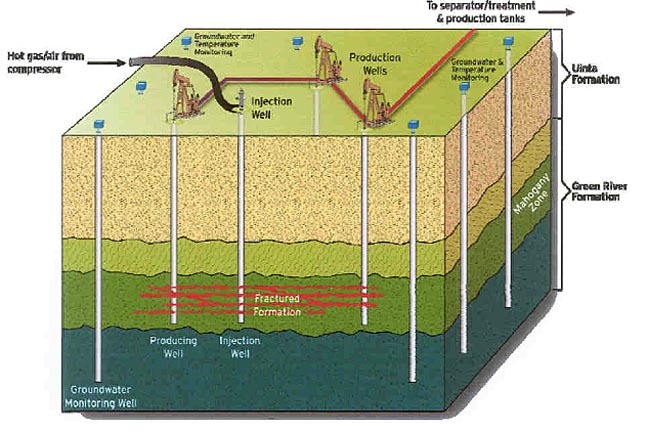 EnShale owns the pilot plant http://www.bullionmm.com/. Its amazing, loing at the time and effort you put into your blog and detailed information you provide. I read through your article and I find it very informative. You really take some time doing a good research for these and I really appreciate it a lot.